Spend less than 30 minutes creating discounts and applying them to the overall checkout list or to each product individually. You will spend less than 30 minutes creating discounts and applying them to the overall checkout list or to each product individually. 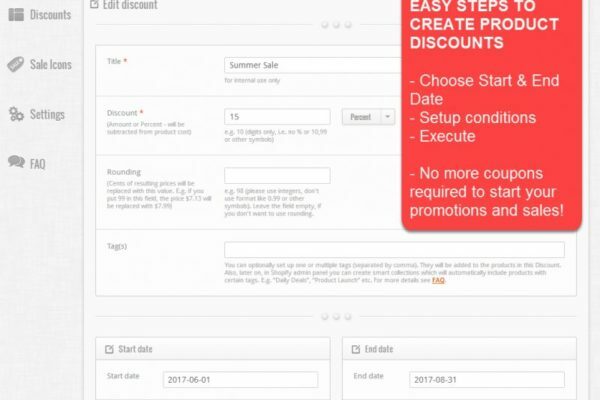 Choose how you want to display discounts, and the application will do the calculation for you. If for any reason you change your mind and decide to stop or to pause a scheduled sale, you can easily do it anytime and the app will revert the discounted prices to their original level. You can choose a badge from an icon library or use your own custom designed image and add it to the products on sale. There is no need to pay additional fees for a separate sales icon app. The installation process is simple and doesn’t take much time because there is no need to perform manual modifications of your theme. Our dedicated team of technical support specialists is ready to help you solve any problem any time of day or night on weekdays. The Shopify bulk discounts & sales manager app simplifies the process of scheduling sales in eCommerce stores that run on the Shopify platform. It automates the process of setting individual promotional product prices to manage sales and saves you a lot of time so you can focus on other important aspects of your business. You can start using our app at no cost with our 14-day free trial – no credit card required. You don’t need any coding skills to install our app for Shopify. Our app for Shopify has a large variety of discount settings, including bulk discounts. We guarantee fast and free customer support. We are running our summer sale event through the app and it attracted many new customers to us. This App is Excellent, highly recommend it for ease of use, so many options. Outstanding support which help you to get the most out of this app. The most easiest and fastest way to create sales and discounts. So far this app works great and cuts down a lot of time when you have a lot of product!